When it comes to the freak bike/mutant bike/franken bike genre, tall bikes are king. A freak bike is any bicycle that isn't a normal bicycle and was built for fun. Most commonly they are made from recycled bicycle parts and include swing bikes, tall bikes and choppers to name just a few. Lately tall bike sightings in Salt Lake City are becoming more frequent. Tall bikes date back to the late 1800s. The most famous model, the Giraffe Lamplighter's bicycle, was built in 1898 by Record Manufacturing Company. Its seat was over seven feet tall, and was used daily by lamplighters to light gas street lamps in Chicago and New York City. From the early 1900s up to the early 1970s, tall bikes were common in many large cities in the USA and Europe. In these places the tall bike was used in parades, circuses and even for casual uses and speed. The actual production on tall bikes seemed to fizzle out shortly after gas lamps were replaced with electric ones and the smaller modern bicycle started to become more practical. In the 70s and 80s, tall bikes became something made at home for fun. As sleek new technology in bicycles became the norm, the tall bike became less common eventually to the point of practical extinction. The tall bike's recent popularity, however, was kick-started by the Black Label Bike Club in Minneapolis, Minn. Black Label, started by Jacob Houle and Per Hanson in 1992, was the first official outlaw bicycle club with their best known chapter in New York City. Their DIY tall bikes were an immediate hit with industrious and light-hearted cyclists around the country and spurred many other freak-bike clubs such as SCUL in Massachusetts, Rat Patrol in Chicago, Dead Baby Bikes in Seattle and C.h.u.n.k. 666 in Portland and New York City. This summer a group of freak-bike enthusiasts have been riding in organized rides right here in Salt Lake City. 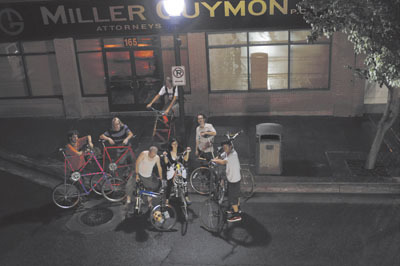 Currently without a name of their own, but riding with others from the Salt Lake City Bicycle Brigade, this SLC group of freak bikers are just in it for the DIY fun. Kemmer Evans, a Sandy resident and pioneer of the SLC tall bike group, started building tall bikes for just that reason. "I think that something that is that much fun and doesn't really cost anything will just keep catching on. The bikes are recycled and the welder is borrowed," he says. Reasons for getting into tall bikes are similar across the board. "I had to be a part of it," says Mark Polichette, who moved to SLC for work and school. Polichette built his tall bike after meeting Evans and riding his. "After riding Kemmer's bike and seeing the bikes he built I had to build one to show him up," he says. Emeliniano Hidalgo, a SLC local and more recent tall bike convert, got into riding tall bikes after Polichette let him ride his. "I was scared to ride it at first, but once I got it I didn't want to stop," says Hidalgo. Earlier this summer they built a new tall bike together for Hidalgo and he hasn't looked back. The chain reaction has just continued with Hidalgo. "When I let other people ride it they have fun and that's the main thing. That's what we do," he says. For Evans and the others, the DIY spirit involved in building tall bikes is a party all on its own. "There are so many ways you can pull from waste: exercise bikes, furniture... almost anything can work," says Evans. The basic tall bike is made by welding two or more bike frames together. "I used two mountain bike frames and kept most of the mountain bike components," says Hidalgo. Once the frames are attached, the drive train is extended to meet it's new elevated demands. Hidalgo explains: "The chain is fixed to one gear, but it still has a free wheel." One of the greatest challenges of riding a tall bike is the fact that you can't just put your foot down and stop for a period of time. Hidalgo has become a pro in the few months he's had a tall bike. "To stop I just hop off, but to slow down I do have a front break." Once mounted, the tall bike rides remarkably like a normal bicycle, but the general public does not treat it like one. "When I rode my tenspeed around people would honk at me, yell at me to get out of the way or tell me to ride on the sidewalk. When I'm riding my tall bike people actually cheer me on and give me the right of way," Hidalgo says. He, along with Polichette and many of the others, actually commute to work (sometimes over two miles daily) on tall bikes. They also ride in SLC cycling events and Hidalgo even entered an ally cat style bike race on his and didn't come in last! When he's out riding, many people ask about Hidalgo's bike and he enjoys explaining it. "When people ask about it and if they can ride it I completely stop and help them ride it. They're always totally amazed." Evans says: "Sometimes people want a practical reason for riding a tall bike. I mean, there really isn't one. It's just about fun." To ride with other freak bike enthusiasts and join in on the fun, keep an eye on http://www.saltcycle.com where most of the planned rides are posted.